1997-2003 enthusiasts rejoice. The Backstreet Boys and Avril Lavigne have announced a North American tour that will kick off in May and run through the summer. "Hooray," someone shouts somewhere as she dusts off the collection of sassy keychains that she bought at Claire's. "I haven't been this excited since Bath & Body Works brought back their glitter lotion!" BSB made the announcement today on Good Morning America, with all members joining in to sing, "Backstreet's back, alright!" "We're coming back out on tour in the U.S. and Canada this summer," continued Kevin Richardson, the mature one. "Tickets go on sale next Friday, March the 21st, and the tour starts May 3rd and guess what? We're gonna have special guest Avril Lavigne...Come see your boys this summer." No confirmation on whether or not Lavigne's husband Chad Kroeger will be making an appearance as well. The price of tickets is still unknown, but I'm guessing it'll be something like $5 or free with a can of soup. 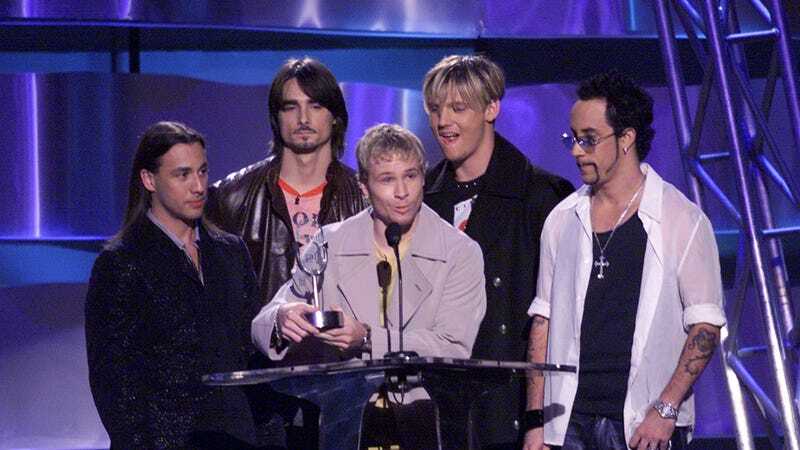 Those Backstreet Boys have to feed themselves somehow or it's back to the workhouse with them.